Ocean View, Merced Heights, Ingleside, and Ingleside Terraces neighborhoods. San Francisco's OMI neighborhoods include Ingleside, Ingleside Terraces, Merced Heights, and Ocean View. The OMI (Ocean View-Merced Heights-Ingleside) neighborhoods on the southern border of San Francisco, east of Lake Merced and west of the San Francisco-San Jose railroad line (today the route of Interstate Highway 280), began as a patchwork of different street grids and speculative real estate ventures. Today's Ingleside, stretching from San Jose Avenue west to Ashton Avenue, started as the 1862 development "San Miguel City" on the east and the 1890 Lakeview neighborhood on the west. Both were sparsely settled until after the 1906 Earthquake and Fire. 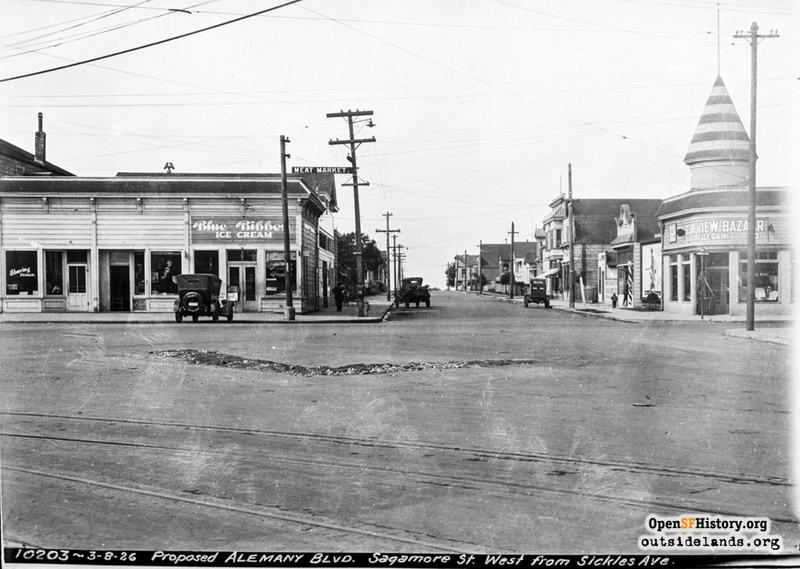 By then, the whole area had become known as Ingleside, named after a roadhouse on the corner of today's Ocean Avenue and Junipero Serra Boulevard, and cemented with the 1895 opening of the Ingleside Racetrack. Today's Ingleside Terraces is the site of the racetrack, and lies just to the west of Ingleside. The Terraces development, while more typical of the adjoining West of Twin Peaks neighborhood than the rest of the OMI—a master-planned "residence park" with high-end architecture, curving streets, and public landscaping—is where the name OMI originated in the 1960s. Residents in Ingleside Terraces wanted to have an affiliation with the neighborhoods to the east and south in solidarity to lobby for better city services, parks, etc. A specific point being made was that Ingleside Terraces was not a closed community. The ridge line of Merced Heights was mostly undeveloped until the twentieth century. Frequented by wildflower-picking parties, one eminence of the three hills was named "poppy hill" by locals. On the eastern edge, along San Jose Avenue, a development named Columbia Heights was platted on either side of Lakeview Avenue in 1893. The Brooks family settled on the western face of Merced Heights in the 1930s and their home became the seeds of today's Brooks Park. The name Merced Heights came when post-World War II subdivisions such as Ingleside Heights filled in the slopes in the 1950s. At the same time, an influx of African-American families began moving to the OMI and by the 1970s made up a third of the neighborhood's population. Ocean View, south of Merced Heights, began as two separate homestead associations. The Railroad Homestead Association filed the street map from San Jose Avenue west to Orizaba Avenue in 1867. In 1870, the City Land Association laid out the grid from Orizaba Avenue west to today's Junipero Serra and the section of 19th Avenue that splits diagonally to the southeast. (The western boundary marked the southwest corner of the old Rancho San Miguel Mexican land grant.) Why the City Land Association did not have its grid meet up with the streets of the Railroad Association is unknown, but actual grading of streets and settlement wouldn't start until years after the establishment of the associations. The name Ocean View may have come from a renaming of the San Miguel Station of the San Francisco-San Jose steam train line at Plymouth and Sagamore Avenues. The train began service in 1865, and another train, the Ocean Shore Railroad, snaked past the same intersection in the early twentieth century. The story passed down about the Ocean View name is that the station marked the first place riders from downtown could see the Pacific Ocean headed south. Read about our I am OMI project, conducted from 2002-2005. Learn more about the OMI neighborhoods in the historic context statement we created for the City of San Francisco.